Each of the accounts in a trial balance extracted from the bookkeeping ledgers will either show a debit or a credit balance. 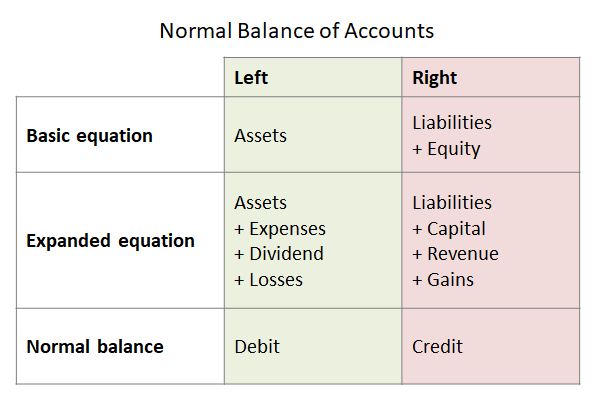 The normal balance of any account is the balance (debit or credit) which you would expect the account have, and is governed by the accounting equation. This can be developed into the expanded accounting equation as follows. Debit simply means on the left side of the equation, whereas credit means on the right hand side of the equation as summarized in the table below. For this reason the account balance for items on the left hand side of the equation is normally a debit and the account balance for items on the right side of the equation is normally a credit. From the table above it can be seen that assets, expenses, and dividends normally have a debit balance, whereas liabilities, capital, and revenue normally have a credit balance. By identifying the type of account (asset, liability etc.) and establishing which side of the accounting equation it is on (left or right), it is possible to determine whether the account would normally have a debit or a credit balance. To understand the concept of the normal balance consider the following examples in relation to the table above. Accounts payable normal balance: Accounts payable is a liability on the right side of the accounting equation and is normally a credit balance. Cash normal balance: Cash is an asset on the left side of the accounting equation and is normally a debit balance. Common stock normal balance: Common stock is part of capital on the right side of the accounting equation and is normally a credit balance. Cost of goods sold normal balance: Cost of goods sold is an expense on the left side of the accounting equation and is normally a debit balance. Dividends normal balance: A dividend is on the left side of the accounting equation and is normally a debit balance. Inventory normal balance: Inventory is an asset on the left side of the accounting equation and is normally a debit balance. Retained earnings normal balance: Retained earnings is part of the equity of the business on the right side of of the accounting equation and is normally a credit balance. Gains on the sale of fixed assets: A gain on the sale of fixed assets is on the right side of the accounting equation and is normally a credit balance. Losses on the sale of fixed assets: A loss on the sale of fixed assets is on the left side of the accounting equation and is normally a debit balance. A contra account is one which is offset against another account. So for example there are contra expense accounts such as purchase returns, contra revenue accounts such as sales returns and contra asset accounts such as accumulated depreciation. Since the purpose of the contra account is to be offset against the balance on another account, it follows that the normal balance on the contra account will be the opposite of the original account. Although each account has a normal balance in practice it is possible for any account to have either a debit or a credit balance depending on the bookkeeping entries made. The benefit of knowing the normal balance is that if an account shows a balance other than its normal balance, for example an inventory account with a credit balance, it is a good indication that there might be an error on the account and further investigation may be needed. It should be noted that if an account is normally a debit balance it is increased by a debit entry, and if an account is normally a credit balance it is increased by a credit entry. So for example a debit entry to an asset account will increase the asset balance, and a credit entry to a liability account will increase the liability. For reference, the chart below sets out the type, side of the accounting equation (AE), and the normal balance of some typical accounts found within a small business bookkeeping system.